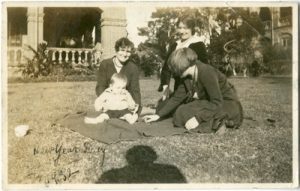 Between 1928 and 1932, Lillian also endured four pregnancies – the first baby died shortly after a premature birth and the second was stillborn. 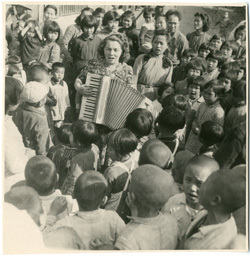 Lillian would later sometimes mention her loss of two babies in her circular letters to North America while commenting on the tragedies of Taiwanese women and families. On November 29th, 1930, Lillian gave birth to Ronald – a healthy baby boy. Almost two years later, on July 13th, 1932, Marilyn was born, also healthy. 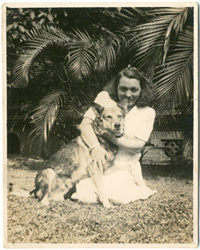 The family would bring several pets into their family over the years – usually dogs, as they helped Lillian feel safer at night when Jim was away working while she and the children were alone at home. 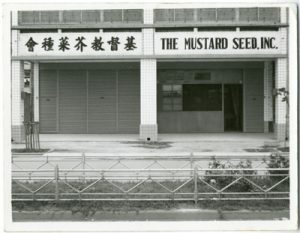 Time moved on and the Dicksons adjusted to life in Taiwan as well as the affects of the Depression in North America. 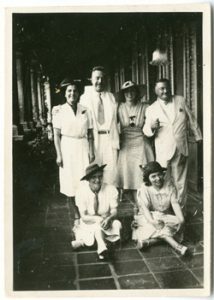 During this early period in Taiwan they received a visit from Lillian’s sister, Amy, and the Dickson family received and sent off many parcels of goods to Lillian’s family in the United States. We are all waiting anxiously for the outcome of it,-it seems so long to have to wait a month after the affair is over, before knowing what has happened. Then we will know about […] whether those among us that are Unionists will be dismissed. It seems to queer to us out here to have people at home making such a fuss as to what ‘fold’ you are in, Unionist or Presbyterian, because here we never think of denominations, the great question here is whether people are Christian or not. 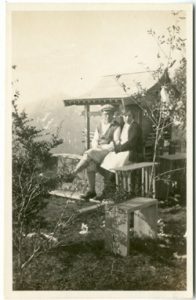 From August of 1933, the Dicksons tended to spend several summer months in a mountain cottage of Japan, where the weather was much more tolerable for the family, with other missionary families nearby. Thanksgiving night as Jim was away, I decided that a big feast would be useless for the children and decided to give them an outing instead. The day was clear and warm and we took a ferry across Lake Ont. to Center Island in Lake Ontario,-the children played in the sand on the shores and on the grass,-it is mostly a park,-we had dinner in a hotel there. In 1935, the family returned to Tokyo, then Karuizawa in the mountains near Mt. Asama in Japan, where the Dicksons would study Japanese for a year prior to their return to Taiwan. 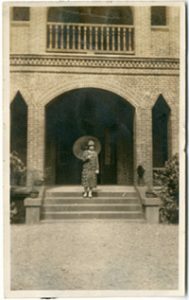 By the fall of 1936 the family was back to their usual work in Taiwan, and continued serving until late October of 1940, when the war forced them into leaving for America. They travelled to Pearl Harbor where they stopped briefly, then San Francisco by late November. By 1941, the Dicksons were reassigned to New Amsterdam, Guyana (now British Guiana) in South America, at Berbice High School. Life in British Guiana was difficult during war time for the Dicksons with limited quantities and variety of edible goods and other items. 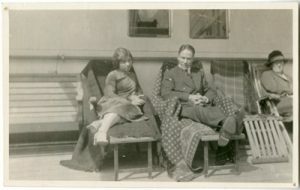 Lillian’s personal letters indicate that while Ronald fared quite well, Marilyn longed to return to the United States, particularly to live with her Aunt Amy. 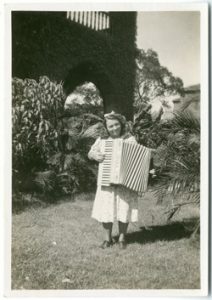 Eventually it was decided that Marilyn would return to the U.S., chaperoned by another missionary couple, eventually to live with Amy and attend school. Shortly after, it was arranged that Ronald was also to return to the U.S. in order to attend a regular school setting. 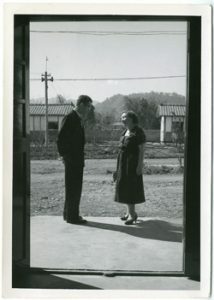 After World War Two ended, Lillian and Jim finally returned to Taiwan where Jim served as Principal of the Taiwan Theological College. Over the next few years, Lillian began working to help serve and build support for those without the infrastructure in Taiwan to care for themselves, their family, or their children. 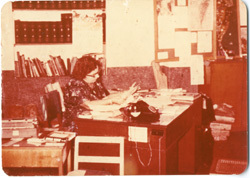 Her work would eventually culminate into the non-profit agency, The Mustard Seed, which was registered in California in 1954. I have no way of knowing how much news you hear at home of political conditions over here. We are living in an atmosphere of intense tension, grim with portent. Every day brings new rumours, fresh alarms. It is only because we are under God’s care and have our eyes and hearts set on one goal, that of bringing the good news of the Gospel to as many as possible while there is time, that we are able to proceed with comparative tranquility. Refugees and evacuees are storming our shores by plane and boat by more than tens of thousands. My guests used to come by ones and twos, now and then a group, but now,- last night we had a letter asking if we could give shelter to an orphanage and a whole theological college student body. There is one place in the mountains where I always meet drama of such unbelievable texture as to make one believe that it is only melodrama that one is playing a part on stage. Each time I enter there into the mountains I think to myself, ‘This time it will be different. This time it will be calm and usual as the other places are,’ and yet, before I leave I run into events that leave me feeling that I am coming out knee-deep in intrigue and dragging cobwebs of mystery around me. If you had lived out at the edge of the world for years on end working among lepers, aborigines, and street children, how would you feel as you faced America once more, and the life there? Would you not feel out of step? It is partly that feeling and partly an overwhelmingly and engulfing joy to be with one’s own kind once more. Our first term in Formosa was lonely. There were only a few foreigners (white people), there were less than a dozen cars on the Island, […]. 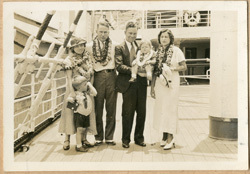 Then I would grow wildly homesick for the sight of a white face, When I reached Honolulu after that first long term of seven years, I saw at last white faces, American men, in overalls, unloading the ship, and they were talking English. I lingered near without seeming to just to hear their voices talking English. After hearing Chinese for so long, English seemed like music. I understood every word, no straining to get the full meaning as I had to in Chinese. I felt that I wanted to shake hands with them and say ‘I’m back! I’m back!’ But, of course, they didn’t know I was just back, they didn’t know I had even been away, and if they had known, still they would not have been able to understand this tumult of emotion. We were marooned on an island in the Pescadores in the town of Makung, halfway to the mainland of China. The ‘wild wind’ precluded leaving by plane or boat, and the Cuban crisis was popping over on the other side of the world. Wistfully just now I think the same. We are always pinning medals on each other and presenting plaques and having pictures taken for the newspaper, or trying to surpass one another in polite ways. ‘How many times have you been around the world? How many books have you written? How many degrees have you secured? How much money have you? What kind of home or car?’ It sounds like children saying, ‘I have five marbles,-how many have you?’ A few hundred years from now surely people will be different,-wouldn’t it be interesting if we could stay around and see? Have you ever tried to run and jump onto something that was already moving such as a train or a car? I remember as a small girl coming home from school in Minnesota we would often try to run and jump on a horse-drawn bob-sled and stand on the runner and get a free ride for part of the way home. But once when I did that, I looked down into the sled and there staring at me with wide glaring eyes and mouth open showing big white strong teeth, was a large wolf. It was dead of course and they bringing [sic] it into town, but it frightened me so I never dared jump on a bob-sled again! P.S. Tell the twins. The other night I found a CENTIPEDE walking across my kitchen floor. As I have screen doors everywhere, I can only guess that when the typhoon blew the window glass in and left large holes for anything to enter, that it also blew in the CENTIPEDE. I banged his head, so I think his last 75 legs were still wiggling. After receiving eye surgery in the U.S. and returning to Taiwan, she signed off a letter to Marilyn and family: “Love to you all,-I still have the patch over my eye, Long John Silver, female edition.” (1997-5006-3-3; letter to Marilyn dated December 3, 1980) In another letter to Marilyn and family, Lillian tells a short story about a guest she received: “Someone called on me the other day and after saying all the polite meaningless things expected such as ‘But you don’t look eighty, etc.’ then he leaned across the desk and spoke to me confidentially, ‘Are your teeth real?’ It was a little like ‘Are you over a hundred?’” (1997-5006-3-3; letter to Marilyn dated January 20, 1981) Slowly, Marilyn began to take over the circular letters to North America, and Lillian passed away on January 14th, 1983, in Taiwan at the age of 82.